The Formula One silly season was especially silly this year. Though the driver lineup remained the same throughout the entirety of the 2018 championship, something that hadn’t ever before occurred in the history of the sport, 2019 is set to come with some of the biggest driver changes we’ve seen in years. Only two teams will feature unchanged driver lineups, and only eight of the 20 drivers will be in the same car next year. Let’s break down the changes. Nothing has changed at Mercedes. Lewis Hamilton renewed his contract with the championship-winning team and will stay on for the next two years. Valtteri Bottas provided underwhelming results, but his performance in the first half of the season and his willingness to play second fiddle to Hamilton earned him yet another one-year contract extension. Sebastian Vettel will continue to hunt down the fifth title he desperately hopes to win with Ferrari, his childhood dream team. Alongside him will be Charles Leclerc, the rookie sensation who quickly showed he deserved a better car than a Sauber in 2018. This will be a matchup to keep an eye on as both drivers are expected to perform at a very high level. Räikkönen swapped places with Leclerc and will thus drive for Sauber, the team that originally brought him into F1 all the way back in 2001. He’ll provide valuable feedback for the team and be a good benchmark for Antonio Giovinazzi, a Ferrari academy driver making his F1 debut. Marcus Ericsson, whose financial backing long helped him keep his seat at Sauber, is moving on to IndyCar. In their first year together at Red Bull, Daniel Ricciardo seemed to have the measure of his much hyped teammate Max Verstappen, but the latter has since proved to be the stronger driver; though Red Bull has also clearly decided to put its eggs in the Verstappen basket. Unhappy, Ricciardo surprised the team by signing with the works Renault team. Ricciardo will drive alongside Nico Hülkenberg, a strong benchmark, and replace Carlos Sainz Jr, who had been on loan from Red Bull but is now leaving the Red Bull junior team’s umbrella with a move to McLaren. Someone needed to take Fernando Alonso’s place following the two-time champion’s retirement, and Sainz saw it fit to try to continue the legacy of his personal F1 hero and fellow countryman. McLaren’s other driver, Stoffel Vandoorne, is on his way out, having gone weirdly backward in 2018 compared to his 2017 performance. Vandoorne was one of the most promising rookie drivers of the last decade but couldn’t seem to perform at the same level as he had in Formula 2. It’s hard to say whether this was because of a lack of motivation driving for an imploding McLaren team, or because of the difficulty in going against one of F1’s all-time greatest drivers. He’ll be replaced by Lando Norris, a young British sensation who came second in this year’s F2 championship. 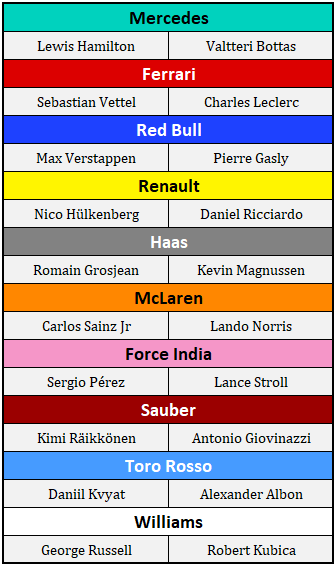 There’s no indication that Norris will be any better than Vandoorne, but he’ll seem stronger in any case by virtue of being paired with Sainz rather than Alonso. As it happens, Norris’s top rivals from the F2 championship have all earned a seat in F1. George Russell, the 2018 champion, will drive for Williams in 2019 alongside Robert Kubica, a beloved driver who had been forced to retire before 2011 as a result of a rally injury. Meanwhile, third-place F2 finisher Alexander Albon will drive for Toro Rosso. Toro Rosso is yet another team with an all-new lineup. Pierre Gasly was promoted to Red Bull following good performances this year, and Brendon Hartley was dropped in favor of Daniil Kvyat, whose comeback story doesn’t quite rival Kubica’s but has great potential. Nothing has changed at Haas. They’ll continue with Romain Grosjean and Kevin Magnussen, both solid midfield drivers and likely not too expensive. Finally, Force India will continue with Sergio Pérez, consistently one of the stronger midfield drivers of the last few years, but has dropped Esteban Ocon, the young and quick Frenchman who many believed would have a bright future in F1. Ocon will instead act as third driver for Mercedes and hope to return in 2020. In his seat will be Lance Stroll. He has not been officially announced but it would be a great surprise should he not. 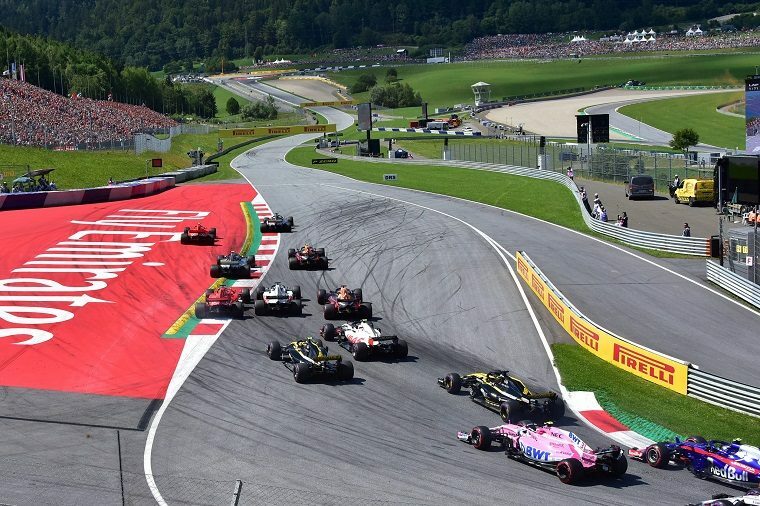 Force India was on the brink of collapse when Lawrence Stroll, Lance’s billionaire father, purchased the team’s assets, paid off its creditors, and recreated the team under the Racing Point name. Stroll Sr was previously paying for his son’s seat at Williams, where he did not make a strong impression. (Nov 30 edit: Stroll has indeed been confirmed for Force India). Stroll Jr notwithstanding, the 2019 Formula One lineup looks to be extremely competitive. It will be exciting to see how the new teammates perform against each other and how they get along on and off the track.